What does the combineLatest operator do? 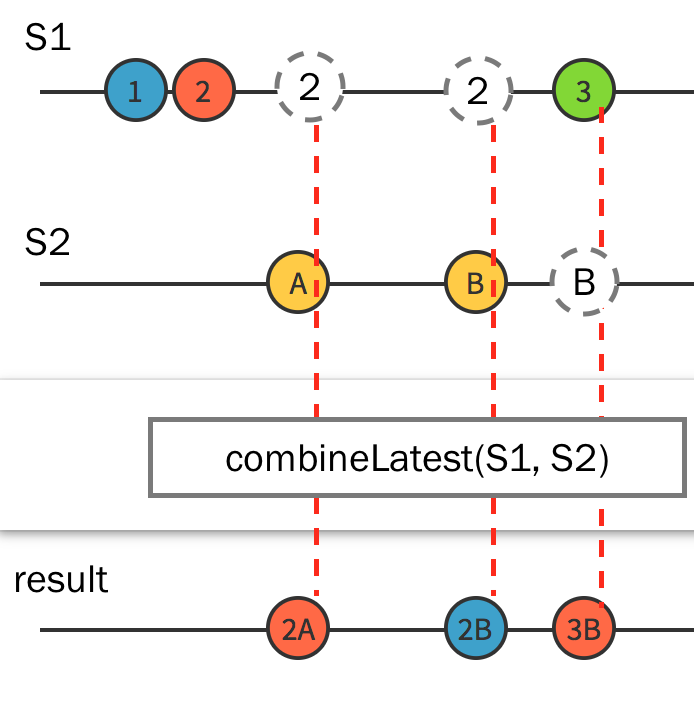 In the last couple of weeks I got to talk to few people who were either still struggling to understand what exactly does combineLatest do or didn’t know about a more recent power feature. So here it is … a post about combineLatest! 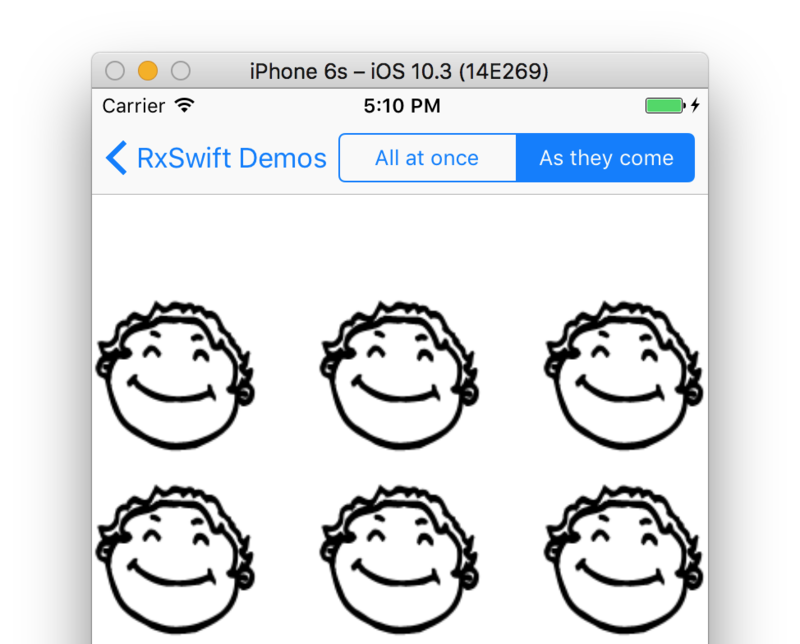 combineLatest is super useful and it was the first thing in RxSwift that really made see how powerful Rx is and showed me what kind of problems can be easily solved with RxSwift. So what does it do? Any time any of the source sequences emits an element, also combineLatest’s result seqiemce emits an element, which contains all the latest values of each of the source sequences. We have two sequences S1 and S2, which emit values - the former emits numbers and the latter - letters. After all source sequences emit for the first time (e.g. they do have a latest value), when any of the sources emits an element combineLatest grabs the latest values of all sources and emits the combined result. combineLatest is particularly useful handling UI input (you can react to all changes in any of the UI’s text fields, switches, etc) or when you fire a number of networking requests and need to react when any of the http responses completes. I created a small example for this article, and added the code to my https://github.com/icanzilb/RxSwiftoniOS repository. If you clone the repo and run it - it’s under number 4 in the main menu. 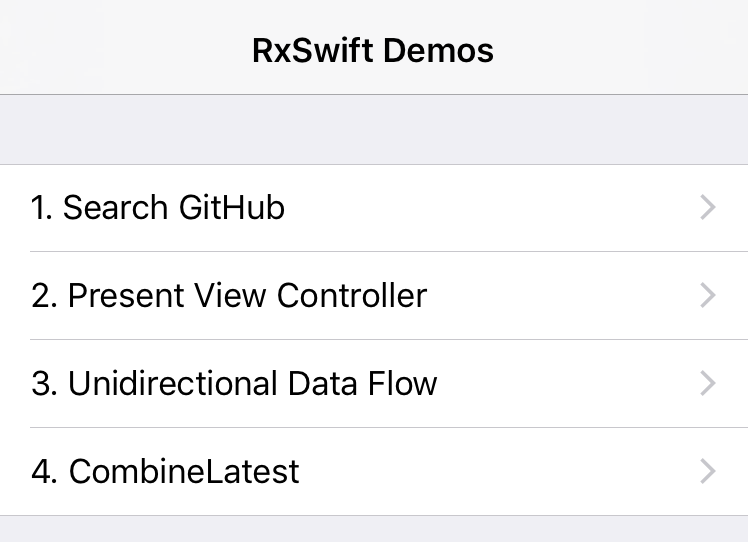 If you’re only interested in the code just peak inside here: https://github.com/icanzilb/RxSwiftoniOS/blob/master/RxSwiftiOS/CombineViewController.swift. So in the example I wrote for this article I’m fetching JSON with the list of my followers from GitHub and show them in a collection view. 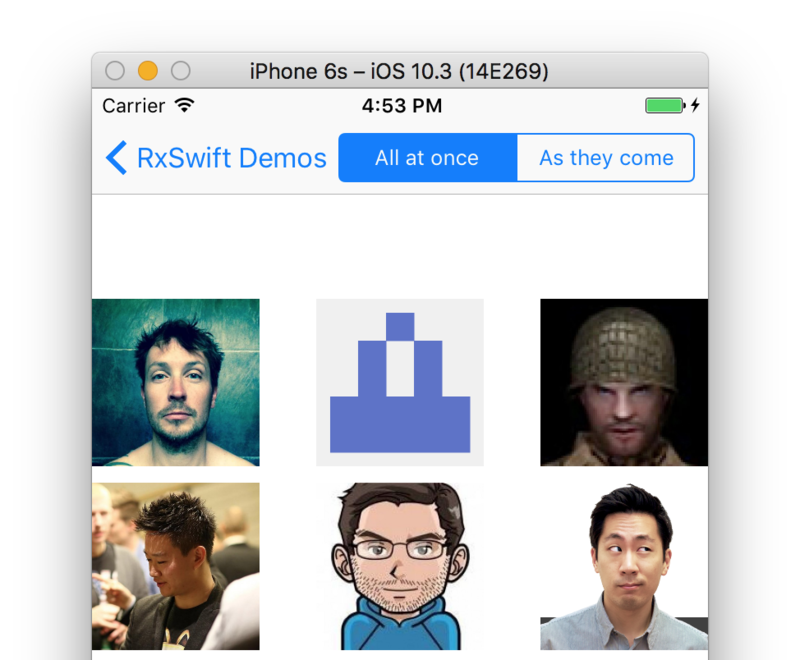 For each follower object in the JSON response I fetch their avatar image and show it in a collection cell. let apiUrl = URLComponents(string: url)! 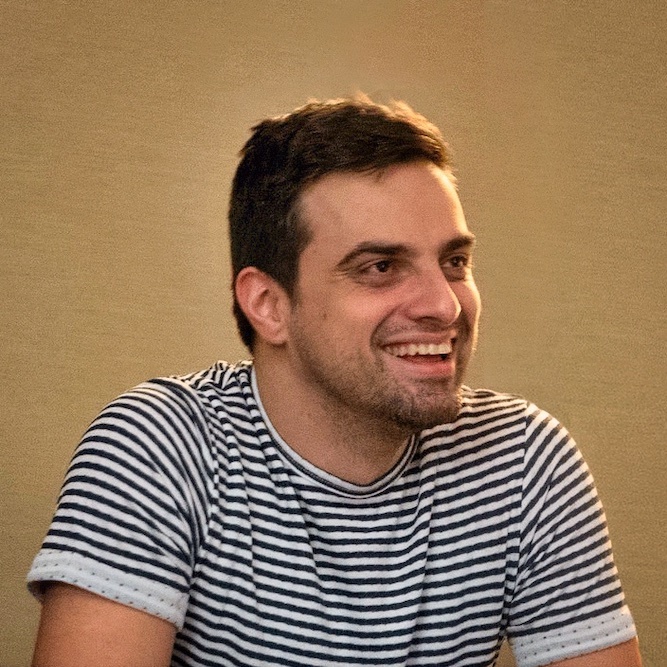 This code makes a request to https://api.github.com/users/icanzilb/followers and gets back a list of JSON objects, then it maps them to an array of User objects. Each User has a login and an avatarUrl properties. The map above takes in the list of user objects [User] and maps those to URLSession observable responses [Observable<Data>]. Nice. Now when all my HTTP requests get their response combineLatest gives me a list of data values, which I turn into images and can bind to a variable or otherwise make use of. When using combineLatest (especially with network requests) you might want to have two very different use cases. In the example above you saw how to fire simulatenously an arbitrary number of network requests and only once all of them have completed emit the result of all of them. But how about if you didn’t want ot wait for all requests to complete? What if you preferred to update the UI as each of the requests receives a response? Well, remember the discussion above? combineLatest does emit for each element from the source sequences but only after all of them have a latest value. So, I wanted to show that as well in the demo project so you will actually find two different methods in the view controller source code getAllAtOnce() and getAsTheyCome(). You can switch between those in the app UI by toggling the segment control at the top of the screen. So the only difference in the code of the two methds (and I mean the only) is that when I’m reloading the collection whenever each of the avatar requests completes I’m providing a default value for each observable. To try this in the app tap on the As they come segment on top. Once more, the demo project for this article you will find on GitHub here: https://github.com/icanzilb/RxSwiftoniOS. I hope this post has been helpful and has shown you a couple of nice combineLatest features. Of course these few examples don’t cover everything - if you’d like to go deeper into combining operators you’re welcome to check Chapter 9, “Combining Operators” and Chapter 10, “Combining Operators in Practice”, which cover far more ground than this post. The book is available at http://raywenderlich.com/store - this is where you can see any updates, discuss in the website forums, etc. 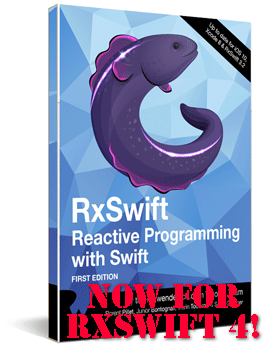 Older// Two free chapters from the RxSwift book!